Councillors at the Royal Borough of Kingston have approved revised plans for Portsmouth Road, part of the borough's £30m mini-Holland funding, now branded as 'go cycle'. Campaigners have welcomed the approval of the scheme, which are a considerable improvement on previous plans. LCC and others lobbied against the initial plans, which would have only offered protected space for cycling on 20% of the route. The approved plans will offer segregation on 85% of the route - and councillors have acknowledged that 'painting white lines on tarmac is not enough'. 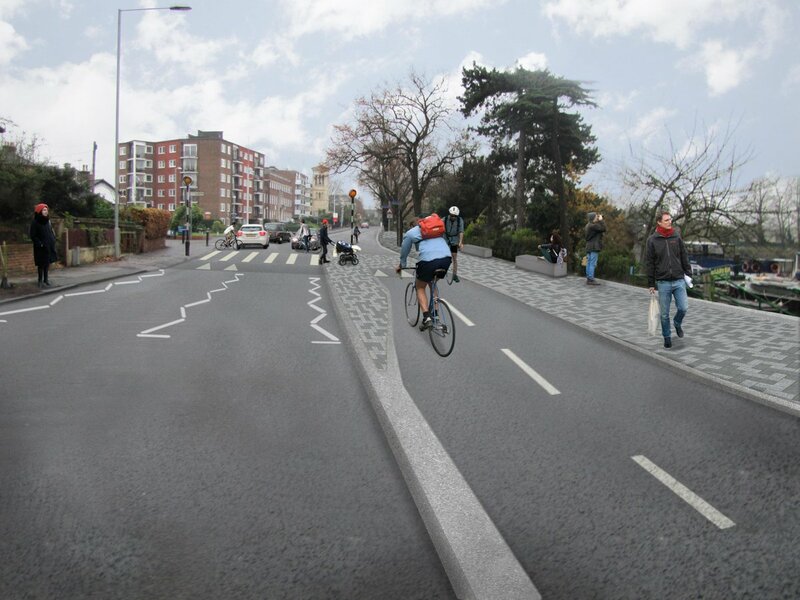 Kingston Cycling Campaign's Nicholas Davies said: "Kingston Cycling Campaign are very pleased that Kingston Councillors have unanimously approved the revised Mini Holland scheme for Portsmouth Road. We look forward to working with the Council and Officers on detailed implementation and on the remainder of Portsmouth Road and the other Mini Holland schemes. We are optimistic that, with goodwill and good sense, a real step change in the cycling facilities in the Borough can be delivered to the benefit of all." “Portsmouth Road is one of 10 major cycling projects we plan to deliver using funding from the Mayor of London’s mini-Holland Programme. Following many months of detailed planning and consultation, I’m pleased that work can now progress on the scheme. “The many benefits of cycling are widely recognised, but we must do whatever we can to protect cyclists and make them feel safer while recognising the need to share space with other road users. Painting white lines on tarmac is not enough. It is only by delivering innovative highway schemes like the one planned for Portsmouth Road that we will make a real difference." Construction of the scheme is due to start in November 2015, with the intention of having the first stage complete by April 2016. More on the plans can be seen at www.kingston.gov.uk/gocycle.